In the first column, we take a look at the time when the foundation was established, learn about the entrepreneur Heikki Herlin and hear a couple of stories about grant-related activities in the 1950s and 1960s. Hanna Nurminen, Chairperson of the Kone Foundation board of trustees with her grandfather Heikki H. Herlin, the co-founder of the Kone Foundation. Photo from a private collection. 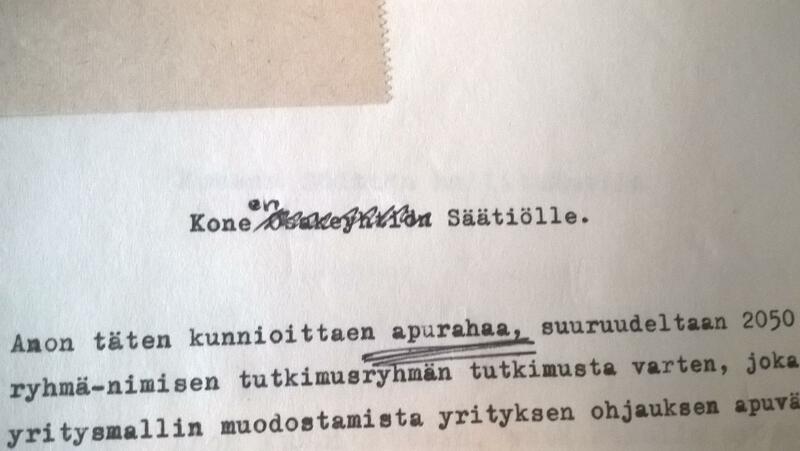 A folder of newspaper clippings collected by Kone Corporation’s president, vuorineuvos Heikki Herlin, contains an advertisement inviting applications for grants provided by the Alli Paasikivi Foundation, published in Uusi Suomi in 1956. Herlin had applied twice unsuccessfully and perhaps thought the third time would work like a charm for him as he drafted a grant application several pages long, signed it, and sent it to the Alli Paasikivi Foundation. He had previously submitted applications to the Jenny and Antti Wihuri Foundation and the Swedish Cultural Foundation. Herlin was not applying for a grant for himself, however, but for a friend who was specialising in childhood psychiatric disorders and psychoanalysis. Herlin thought that this kind of expertise was badly needed in Finland also. In spite of well-written and well-argued applications, none of his applications produced a favourable result. As Herlin applied for grants, however, he simultaneously happened to test the operation of the foundations and the grant application process. As early as December 1955, Herlin had asked E. W. Åberg (with the Finnish honorary title “teollisuusneuvos”) about the foundation Åberg had recently founded. Åberg and his wife Hedvig had donated the majority of their Olvi shares to the foundation, which focused on children, elderly people, the preservation of local heritage, agricultural industry, and, naturally, also the continuity of the Olvi company. ”As I myself have had somewhat similar thoughts, I would be very grateful if you could, at your convenience, send your foundation’s rules and regulations to me to study. Although the foundation I am thinking of will probably not be quite the same as the foundation you have established, I believe, nevertheless, that by studying your rules and regulations I will be able to learn many of the things that you have come to learn”. Unlike the Åbergs, Heikki Herlin did not donate the majority of Kone shares to the foundation but a significant number of shares anyway. We will take a closer look at the history of the finances of Kone Foundation in a later article. A few years later, with reference to his earlier, unsuccessful grant applications, Heikki Herlin wrote to his friend, informing him of a new funding opportunity. ”Last year, I succeeded in organising a foundation where I am a trustee and have quite a say, and I am confident this foundation will give you a grant (…) You must draft some kind of application, however, referring briefly to your work. That is all we need. Even though I am the chairman, the members of the foundation have the right and even the obligation to assess the grants and scholarships granted, so for their sakes it would be nice if an application existed”. As Heikki Herlin mentioned in the letter, he really had quite a say in the foundation. Although the charter of foundation contained a detailed description of how the board of trustees was to vote on decisions and, should there be a tie, decide by drawing lots, the last sentence reversed this: ”For as long as vuorineuvos Herlin is on the board of trustees, whatever the result of the vote in a board meeting, Herlin’s side shall win”. When Herlin talked about the members of the foundation, he referred to the first Kone Foundation Board of Trustees, whose members were his son Pekka Herlin and two male relatives: Kustaa Vilkuna, who was the father of Pekka’s wife Kirsti, and Kaarle Kalliala, who was Pekka’s godfather and the husband of Heikki’s cousin Hanna-Liisa. Another person involved at the time the foundation was established was Lauri Paavolainen, the father-in-law of Heikki’s daughter Minnami, but he died in 1958. The men of the foundation were united not only by family ties but also by various collaboration relationships – financial and even political. They were all influential people in their own fields. Paavolainen had been managing director of Strömberg, Kalliala was ex-director general of Säästöpankkien Keskus-Osake-Pankki, and Kustaa Vilkuna was a professor of ethnology, a significant political figure in the Agrarian League, and a friend and supporter of Urho Kekkonen. Board membership in Kone Foundation was for life. 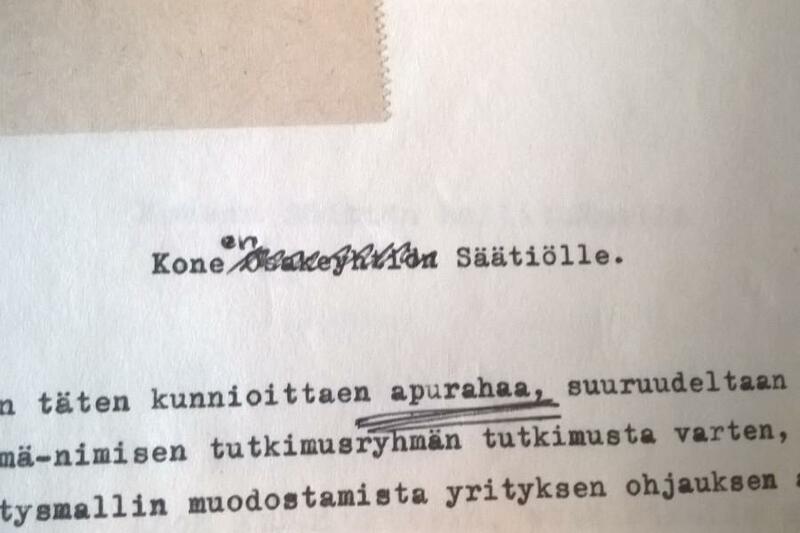 When Kalliala died in 1970, there was some discussion about appointing a new member, but the matter was shelved for nearly a decade. During the 1970s, the foundation’s operations were carried out by Pekka and Heikki Herlin together with Kustaa Vilkuna. The foundation’s director from the 1950s to the beginning of the 1980s was Eero Koskivaara, Kone Corporation’s financial manager. New members were not appointed until after Kustaa Vilkuna’s death in 1980. Heikki Herlin was the chairman of the foundation until his death in 1989. Now in the 2010s, it is easy to ask why women were not involved in the foundation’s activities. After all, the Herlin family had a lot of competent, educated women. Kirsti studied Finnish, Minnami studied sociology, and cousin Hanna-Liisa was an architect. You can hardly say that the times were such, for at that time Finland had significant foundations where women participated in their operations or management. One example is the Yrjö Jahnsson Foundation, whose founder Hilma Jahnsson also acted as the chair of the foundation. Maybe what decided the matter for Kone Foundation was Heikki Herlin’s personal views and expectations. The good old boys ruled. In the first few decades of the foundation, applying for and giving grants was pretty straightforward. Applications were sent as letters to the foundation, and sometimes this was after they had been discussed in person with the Herlins or Vilkuna. There were no application forms or specified instructions available to applicants. The most important thing was that the subject matter was compelling and that the applicant had credibility based on his/her position or connections. As late as the 1960s, the letters were still usually addressed to “”Dear Brother” (in Finnish “hyvä veli”, abbreviated H.V.). On account of the letter you wrote to my father, I hereby inform you on behalf of Kone Foundation that you will receive the grant you need. Please let us know the exact amount you need as soon as possible, and we will send it to you by return mail in the form you prefer. We cannot make a formal decision on the grant before the spring meeting of the foundation in March, by which time we hope you will have sent us an application in the form of a few lines explaining your need for the grant and some kind of extract from your CV. That is how Pekka Herlin responded to an Åbo Akademi University professor who applied for a travel grant. Although the grant was agreed on and used before the foundation’s ordinary meeting, the decision was documented in accordance with good practice. The above kind of decision to give a grant is a good example of how simple and straightforward the grant process was in those days. In the first few years, however, many applicants did not necessarily know whether they should apply for a grant from Kone Corporation, Kone Foundation, or directly from President Herlin. Also, the difference between charity and grant was not always clear, neither to the foundation’s members nor to the applicants. 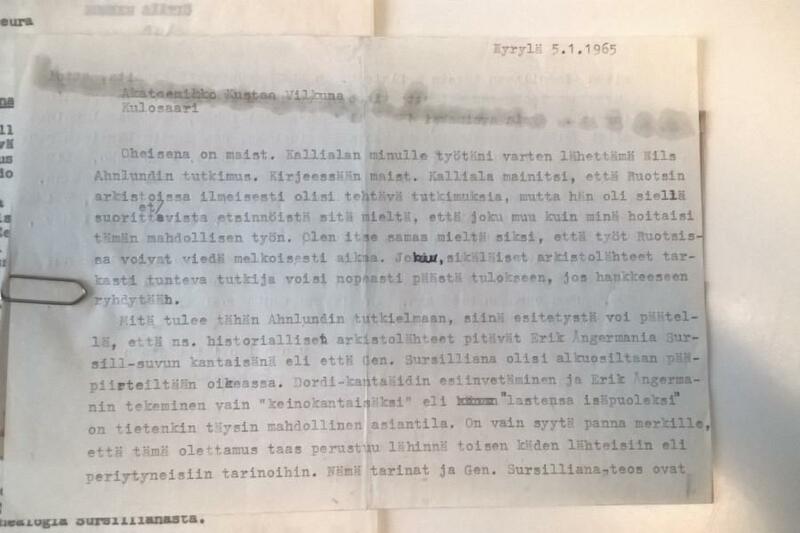 A friend of Heikki Herlin – let’s call him Matti – received, quite unexpectedly, a brief letter from Heikki Herlin in 1958, encouraging him to apply for a grant. Matti regarded the letter as arrogant, and wrote to Herlin saying that nobody wants to be a victim of charity. It turned out that Heikki Herlin had thought he would be doing a good deed by informing about the opportunity to apply for a grant and had requested Pekka to write the letter in question. Pekka, true to himself, had written a brief letter in a matter-of-fact style, and Herlin the father had not wanted to interfere in this son’s work “(…) as I have done on a few occasions, and he has been slightly offended.” Brisk correspondence ensued, and finally the matter was settled. Matti agreed to accept the grant offered, even though he still regarded it as charity in disguise. Matti’s case is a good indication of how Heikki Herlin, as the chairman of the board of the recently established foundation, was eager to give grants on his own initiative and felt he was doing good deeds in helping people. Requests for help and suggestions for participation in various initiatives were familiar to him even before Kone Foundation: he was, after all, a wealthy industrialist and actively involved in various organisations and networks. On the other hand, he was blind to dependencies resulting from differences in wealth, and to his own position of power. In this respect, Heikki Herlin’s attitude is comparable to that of an autocratic but well-meaning ironworks owner of yesteryear. Information about the foundation was passed through the grapevine and through the networks of the foundation’s members. The Herlins and Kustaa Vilkuna proposed support for several causes that were of personal interest to them. Kone Corporation, on the other hand, had an impact especially on the support provided for students of technology. As late as the 1960s, the foundation supported vocational studies, for example, through Kone Scholarships for talented students of limited means at Helsinki College of Technology. As a rule, the foundation held a low profile. A major initiative supported by the foundation in the 1960s was a revised edition of the genealogy study of the Sursill family. For this study, genealogist Eero Kojonen, employed to carry out the project, searched for information through newspaper ads, as well as by using fundamental study methods. When he advertised in Uusi Suomi, the foundation’s name was removed from the text. Heikki Herlin thought it might be a good idea to publish the same request for information in left-wing newspapers as well, but “the name of Kone Foundation need not be mentioned; it could be interpreted as an advertisement and have an adverse effect on the actual matter.” It remains unclear whether it was Kone Corporation or Kone Foundation that might have been advertised. Maybe Herlin thought that people might not disclose potential research information if they found out that a cultural project was backed by a renowned lift and crane company. If it was unclear to applicants whether grants were to be applied for directly from Heikki Herlin or from Kone Corporation or Kone Foundation. In the 1950s, grants were made for a variety of reasons. They included, for example, music scholarship students’ studies in the United States, support for an association advancing psychoanalysis in Finland (Psykoanalyysin edistämisyhdistys), annual scholarships for students of the College of Technology mentioned above, and support for the 20th anniversary of the Ässä regiment in Helsinki. Support was also granted for Uusi Kuvalehti, a magazine founded and published by Ilmari Turja. 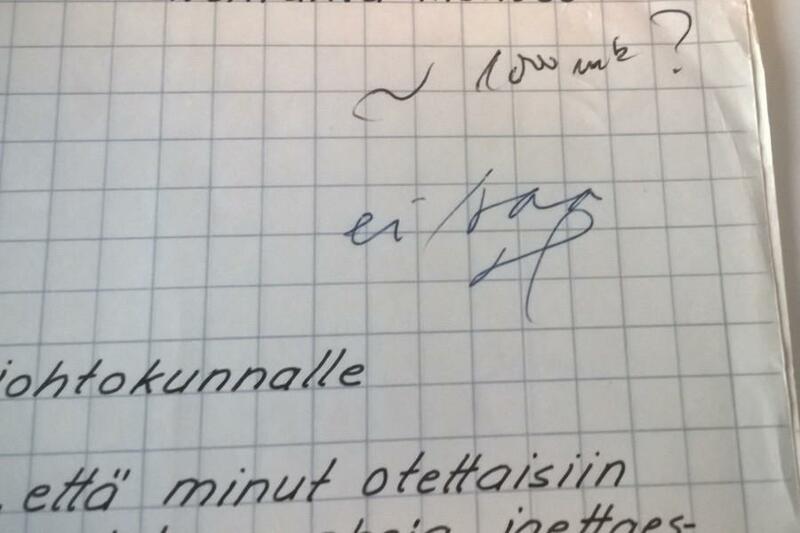 Turja’s magazine was “for all people,” and it was his answer to Suomen Kuvalehti. The magazine gained its reputation from critical journalism, for instance, by exposing corruption and drawing much attention to the fact that cat fat was being used in the production of margarine. Turja and Heikki Herlin knew each other from way back; they – together with Kustaa Vilkuna and a few others – had founded Kulosaaren yhteiskoulu, a coeducational school in Helsinki in 1940, and they were also its board members. 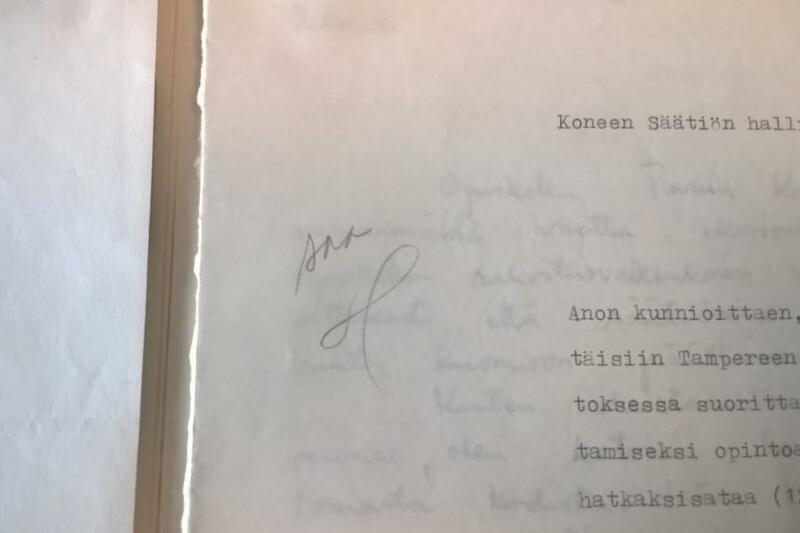 The friendship between Kustaa Vilkuna and Turja also dated back in time: they had belonged to the same circle of friends in the Academic Karelia Society in the early 1930s. The support granted to Turja’s magazine is, on the one hand, a typical example of the role networks played in the making of grants and, on the other hand, an indication that the foundation also made it possible to support reformist efforts. In addition to supporting various organisations, associations, and students, grants were naturally also given to scientists. In the 1960s, these were often travel or translation grants, whereas in the 1970s, grants were allocated to actual research work. The Faculty of Economic and Social History at the University of Helsinki received a sum of money in 1966 for certain purchases, which, according to professor Sven-Erik Åström, contributed greatly to the quick establishment of the faculty at the university. Fewer grants were made for creative work, but some interesting examples can be found in the 1960s. Author Erkki Vala received a grant to write a book about the Finnish literary group Tulenkantajat (The Flame Bearers), and Eino S. Repo was given a grant for his literary work. Repo probably used the grant to work on a collection of anecdotes about evacuees in cooperation with the poet Harri Kaasalainen. Vala and Repo both had connections to the foundation’s members. Erkki Vala was the common-law husband of Heikki Herlin’s sister-in-law, and Repo was Pekka Herlin’s close friend. In addition, Repo’s grant was certainly partly attributable to Kustaa Vilkuna, for the grant was approved at about the same time as Vilkuna was lobbying to make Repo, a member of the Agrarian Party, the new president of the Finnish Broadcasting Company. Urho Kekkonen supported Repo, but being the President of Finland, he could not officially participate in the election. Instead, his “grey eminence” Vilkuna wrote a recommendation supporting Repo and also otherwise acted behind the scenes to have him elected. Does not get a grant. The first information on the Ostrobothnian Sursill family dates back to the 17th century, and their history is better documented than that of any other Finnish family. In 1850, dean Alcenius, who had studied the Sursill family for two decades, published the results as a book entitled Genealogia Sursilliana. The book contained information on hundreds of families descended from the Sursills, and Finnish genealogists valued it as an important source of information for a whole century. In 1959 Kone Foundation decided it was time to update this mammoth work on genealogy. The reason for the decision is not very difficult to understand. Both Heikki Herlin and Kaarle Kalliala were passionate enthusiasts of genealogy, and studying the history of a family with roots in Ostrobothnia was probably not that strange to Kustaa Vilkuna, either. The methodology and possibilities of genealogy had naturally improved a great deal since Alcenius’s days, and there was demand for a revised edition. 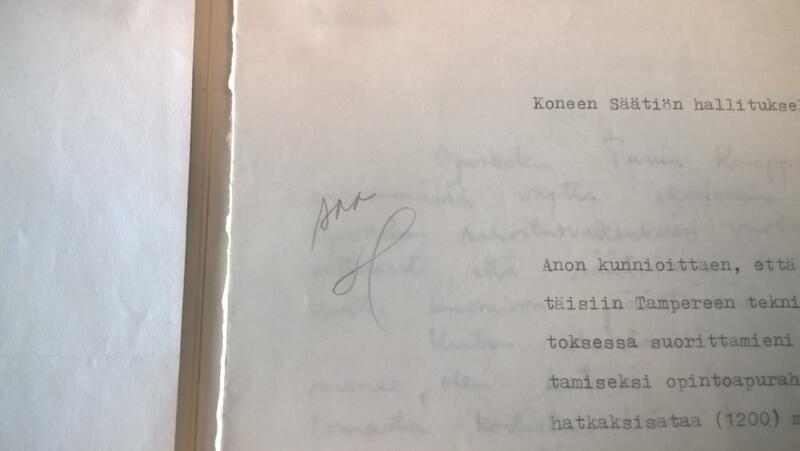 Kone Foundation signed an agreement with Eero Kojonen in 1959 on supplementing the family information and correcting errors in Genealogia Sursilliana up until 1800. According to the agreement, Kojonen would be paid 2,500 Finnish markka per printed page, and the revised edition would be published in 1963. As the project advanced, both the genealogist and the enthusiasts of Kone Foundation wanted more, and the project expanded in both time and in the number of families studied. The work Sursillin suku – Genealogia Sursilliana was finally published in 1971. Kojonen had collected information up until 1850 and somewhat later. Even the funding had been changed during the project to be a monthly research grant; after all, Kojonen had worked on the project for nearly a decade. He did not work entirely alone, however, for Heikki Herlin, Kalliala and Vilkuna acted as an advisory board within the project. Professors Yrjö Blomstedt and Sven-Erik Åström were also involved, at least part of the time. As the Sursill family project was launched, Heikki Herlin resigned as the president of Kone. Pekka Herlin had become the administrative director of the company in 1958, and in 1964 he officially became the president. It is not surprising, then, that Heikki Herlin had time for long discussions with Kojonen on the details of the ever-expanding genealogy study. No other project funded by Kone Foundation in the 1950s or 1960s seems to have attracted so much active correspondence and discussion of the smallest of details. Undoubtedly, to produce an equally significant work as Alcenius had done over 100 years earlier was close to Heikki Herlin’s heart. When the book was finally reviewed in the genealogy journal Genos in 1971, it was said to be easy to read and intended for the general public, and yet extremely useful for all genealogists. As the Sursill family was a major challenge and only one full-time genealogist was working on the project, a single book was not big enough for the project. Kone Foundation’s minutes from the 1970s mention a plan to continue the Sursill project, but in practice it did not receive the same focus as in the 1960s. After the Sursill project, Heikki Herlin continued his own studies, publishing, for example, a family history in commemoration of the 100th anniversary of the birth of his father, Harald Herlin. 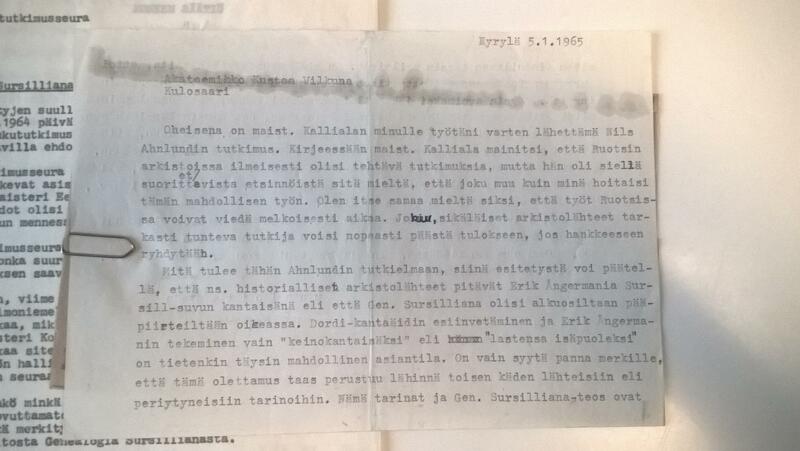 This letter from researcher Kojonen to Vilkuna shows how active the correspondence and discussion of the smallest of details was about the genealogy study. Where the genealogy of the Sursills was important to Herlin and Kalliala, Pekka Herlin, in contrast, wanted to support the study of industrial and financial topics. One such project proposed by Pekka Herlin was a study of the metal industry in Finland, published in 1963 under the title Metalliteollisuus Suomen kansantaloudessa. Pekka Herlin was one of three editors, the other two were Olavi Larna and Olavi Niitamo. The theme of the publication, consisting of several sub-studies, was an analysis of the structure of the metal industry and an outline of the measures needed to meet its growth targets. The study was the first of its kind in Finland, and it was enthusiastically received. Pekka Herlin’s hand is also visible in business studies funded in the early 1970s, such as professor Pentti Malaska’s (a pioneer in Finnish futures studies) study on decision-making in business, and many other study projects that examined business operations from new perspectives. Many of the subjects sound very topical to the modern ear, such as information system group, system group for project staffing problems, or systematisation of automatic data processing methods. Karl-Erik Michelsen, who has conducted research in the history of Kone Corporation, says that in modernising Kone’s operations, Pekka Herlin sought theoretical knowledge to support his new business concept and discussed the subject with the above mentioned Olavi Niitamo, Director General of Statistics Finland, and Pentti Malaska, Professor of Statistics and Mathematics at the Turku School of Economics. He also asked Niitamo to set up a system group in support of Kone’s operational management to develop an information and result control system. It is, therefore, not surprising that he also wanted to seize the opportunity to support cutting-edge research essential to the company, which was made possible by Kone Foundation. Sometimes the subjects for support proposed by Pekka Herlin were close to his own family, such as in 1971 when 52,000 Finnish markka were granted to Helsingin Suomalainen Yhteiskoulu school (SYK) to purchase Hewlett-Packard data processing equipment. A probable reason for this grant is that three of Pekka and Kirsti Herlin’s children were enrolled at SYK at that time, and the youngest two would soon be applying for admission. On the other hand, the grant was small as compared with Pekka’s and Kirsti’s own school days. Their fathers both participated in founding and providing funding for Kulosaaren Yhteiskoulu, a school which Pekka and Kirsti – neighbours at the time – attended and graduated from. A major cultural effort funded by Kone Foundation in the 1970s was based on an idea originally presented by Kustaa Vilkuna in 1971, namely to photograph the medieval manuscript Codex f.d. Kalmar (Codex Aboensis), for the use of Helsinki University Library. The manuscript was at that time housed in the National Library of Sweden in Stockholm, where it remains today. This magnificently illustrated manuscript had been in use in Finland, potentially included Agricola’s notes, and had ended up in Sweden in the 16th century. The foundation’s other board members accepted the idea of photographing the codex, and in the very next meeting Heikki Herlin suggested that Kone Foundation should publish a facsimile edition of the codex with a study describing its early stages, and that the work would be dedicated to Vilkuna on his 70th anniversary. Like the Sursill genealogy study mentioned above, this project also turned out to be more extensive than what Herlin had originally intended. The festive publication of Codex Aboensis finally took place in Munkkiniemen kartano in May 1978. Present were a group of highly distinguished guests, including the President of the Republic of Finland. The work was dedicated to Vilkuna, who had already turned 75. Vilkuna wrote a large part of the commentary section of Codex Aboensis. Also included were analyses by professors Yrjö Blomstedt and Olavi Ahlbäck, although neither of them could prove with certainty that the manuscript had originated in Finland. 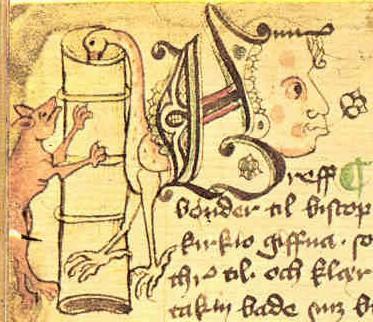 In his own analysis, Vilkuna referred to the ample illustrations in the codex, identifying objects that were used in Finland Proper in the Middle Ages. Vilkuna argued that the objects proved the origin of the codex was Finnish, and to announce the collection of manuscripts as Finnish property, he named it Codex Aboensis (Turku manuscript). Swedish scientists have later proved that the magnificent illustrations of the manuscript are not by the same person as the text. According to these scientists, the manuscript was prepared in the middle part of the realm, i.e. in today’s Sweden. This theory has been criticised, for example, by Helena Edgren, a Finnish scholar. 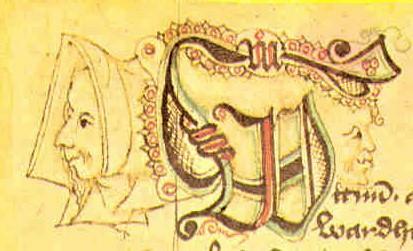 Janken Myrdal, an agricultural historian who examined the illustrations of the manuscript to respond to the criticism, acknowledges the criticism and admits that the illustrator may have had some connections to Finland. Vilkuna had such a firm belief in his own view that we can only imagine the ardent and lively discussions that would ensue if this influential ethnologist of the 20th century could meet the text analysts of the 21st century. In the foundation’s first few decades, applying for a grant was pretty straightforward and so was reporting. No actual reports were expected from the grantees. Often a letter of thanks was enough. The letters were personal thank-you notes, but sometimes the grantees chose to emphasise the role Kone played in the background of the foundation and the grant, maybe as a kind of tribute to the Herlins. In the first few years of its history, Kone Foundation was definitely Kone foundation. The grantees were familiar with the company and could perhaps say that they had received their grants from Kone. The foundation was not advertised in public, and its activities were quite small-scale in other respects as well. Of course, grants were given every year and the foundation conducted several significant acts of culture, such as the survey of the Sursill family and the facsimile of the medieval manuscript – despite its origin. Pekka Herlin also benefited from the foundation directly, as he boosted his company’s success by supporting science and technological research. All the same, the foundation’s operations were widely varied and characterised by the good old boys up until the 1970s.